Sign for March 21- April 19. The design center features the Ram, the Greek sign for Aries, the name of the sign in Hebrew, and Nissan the seventh Hebrew month. The redish color of the tie is the color of Aries. The 12 zodiac signs are featured in the stars. Sign for June 22-July 22. The design center features the Crab, the Greek sign for Cancer, the name of the sign in Hebrew, and Tamuz the tenth Hebrew month. The grey color of the tie is the color of Cancer. The signs of the zodiac are in the background. Its representation as a crab (or lobster or crayfish) is related to the crab in Greek mythology that pinched Heracles while he was fighting the Lernaean hydra. Crushed by Heracles, the crab was rewarded by Heracles' enemy, Hera, by being placed in the heavens. Sign for December 22- January 19. The design center features the goat, the Greek sign for Capricorn, the name of the sign in Hebrew, and Tevet the fourth Hebrew month. The brown color of the tie is the color of Capricorn. One explanation of the fishtail with which the goat is often represented is found in the Greek myth of Pan, who, to avoid the monster Typhon, jumped into the water just as he was changing into animal shape. The half above water assumed the shape of a goat while the lower half, the tail, assumed the shape of a fish. Sign for May 21- June 21. The design center features the twins, the Greek sign for Gemini, the name of the sign in Hebrew, and Sivan the ninth Hebrew month.The green color of the tie is the color of Gemini. It is represented by a set of twins (in Egyptian astrology by a pair of goats and in Arabian astrology by a pair of peacocks). In addition to their identification as Castor and Pollux, the twins have also been related to other celebrated pairs, such as the younger and older Horus, or Romulus and Remus. Sign for July 23-August 22. The design center features the lion, the Greek sign for Leo, the name of the sign in Hebrew, and Av the eleventh Hebrew month.The golden color of the tie is the color of Leo. Its representation as a lion is usually linked with the Nemean lion slain by Heracles (Hercules). Sign for February 19- March 20. The design center features the fish, the Greek sign for Pisces, the name of the sign in Hebrew, and Adar the sixth Hebrew month.The green color of the tie is the color of Pisces. Its representation as two fish tied together is usually related to the Greek myth of Aphrodite and Eros , who jumped into the river to escape the monster Typhon and changed into fish, or, alternatively, the two fish that carried them to safety. Sign for November 22-December 21. The design center features the bow, the Greek sign for Sagittarius, the name of the sign in Hebrew, and Kislev the third Hebrew month.The purple color of the tie is the color of Sagittarius. It is represented either by a centaur shooting a bow and arrow or by an arrow drawn across a bow. The Babylonians made the identification of Sagittarius as a mounted archer as early as the 11th century BC. Sign for April 20-May 20. The design center features the Bull, the Greek sign for Taurus, the name of the sign in Hebrew, and Iyar the eighth Hebrew month. The pink color of the tie is the color of Taurus. The signs are featured in the background. Its representation as a bull is related to the Greek myth of Zeus, who assumed the form of a bull to abduct Europa. Sign for August 23- September 22. 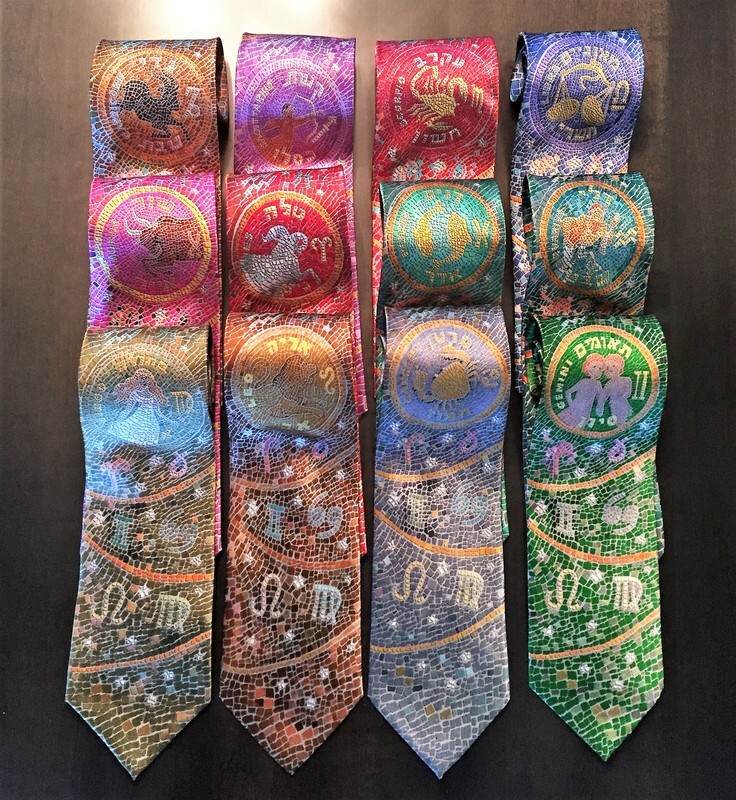 The design center features the maiden, the Greek sign for Virgo, the name of the sign in Hebrew, and Elul the twelfth Hebrew month.The olive color of the tie is the color of Virgo. It is represented as a young maiden carrying a sheaf of wheat. She is variously identified as a fertility goddess (the Babylonian and Assyrian Ishtar, among others) or the harvest maiden (the Greek Persephone and others). Sign for October 24-November 21. The design center features the scorpion, the Greek sign for Scorpio, the name of the sign in Hebrew, and Cheshvan the second Hebrew month. The red color of the tie is the color of Scorpio. Its representation as a scorpion is related to the Greek legend of the scorpion that stung Orion to death (said to be why Orion sets as Scorpius rises in the sky). Another Greek myth relates that a scorpion caused the horses of the Sun to bolt when they were being driven for a day by the inexperienced youth Phaeton. Throughout history people have shown an interest in the stars. The zodiac signs can be traced to Babylonian days. The ancient synagogue of Beit Alpha had in its center a marvelous mosaic floor with the 12 signs. The floor features the Hebrew names of the zodiac with the names of the Hebrew months.